The only bummer about these devices is that many of them are quite expensive – like in the hundreds of dollars range. So typically a sous vide water oven will cost at least $200, and the nice ovens will cost around $300 – $400. Hey, we're not all billionaires, and there is a good way to get started for less than a hundred dollars, or just above, with immersion circulators. This can create the sous vide cooking technique, on a budget, and without a big piece of equipment to clutter your kitchen. They may be missing some of the fancier features like bluetooth communication, apps, or high volume of water circulation but they get the job done, well, and with style. If you are looking to start out with sous video cooking without breaking the bank, then one of these immersion circulators are what you need. The types and styles are growing fast. At the original publishing of this post, there were just two that I would consider inexpensive. 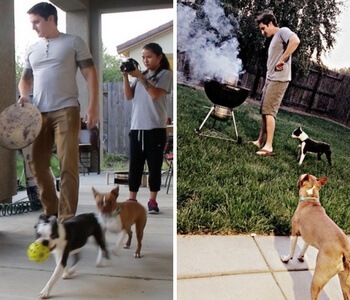 Now, just two months later, there are six. I have purchased all six and full reviews are coming soon, but below you'll find see my first impressions. PS. Here's the list of premium immersion circulators, including my #1 overall pick after testing 13 models. If you just want the best one and don't want to read the reviews of al six, spoiler alert: Our top pick was the 2nd generation from Gourmia (very nice brand). It's the most stylish one in this price range, has a much stronger motor than most, and it comes in five colors. It's only available from 3rd party sellers on Amazon for the moment, or you can keep browsing to see which brands of cheap immersion circulators are available. 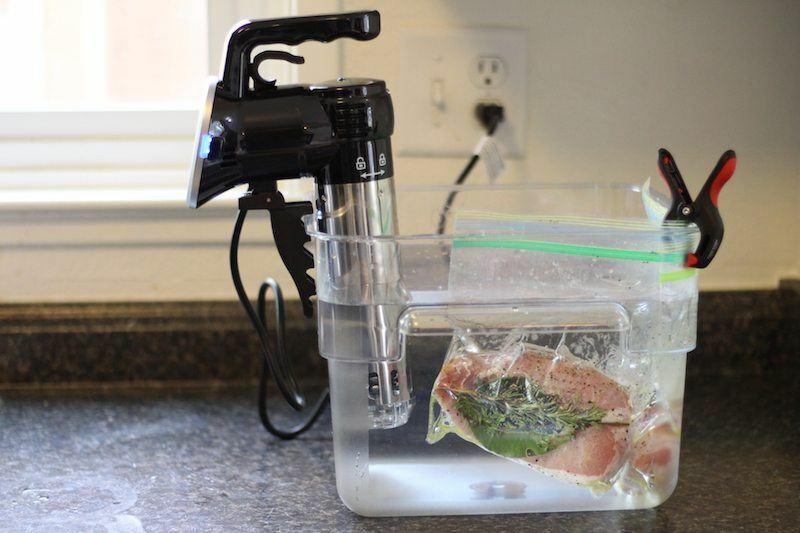 This ‘pod' sous vide immersion circulator is designed for ideal use with a standard 3 to 5 gallon pot that most cooks already own. It is one of the lightest units available, weighing in at 2.3 pounds compared to an average size of around 4 pounds for other immersion circulators. 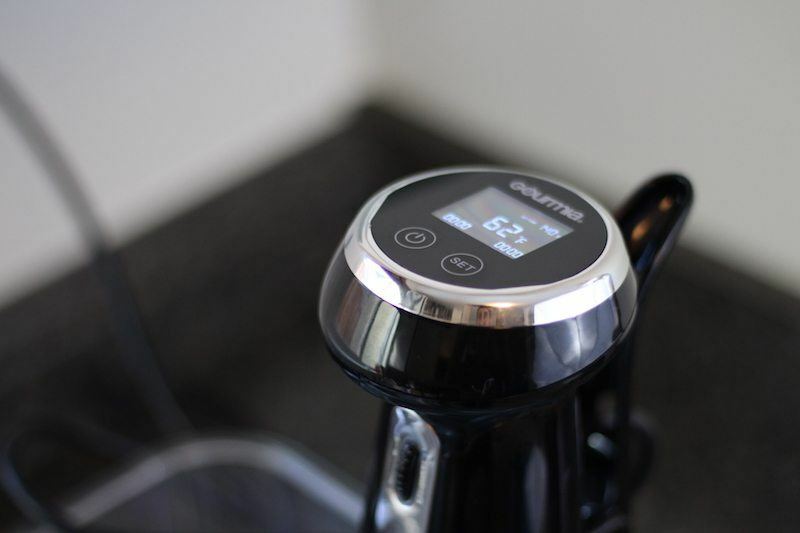 The Gourmia Pod Immersion Circulator utilizes 1200-watts of energy to quickly heat water to the desired temperature and then circulate it evenly to cook your items efficiently. It simply clips on to your container of water and temperature and time are set via the LCD display. It can circulate 5.6 liters of water per minute, which is less than some of the others on this list. 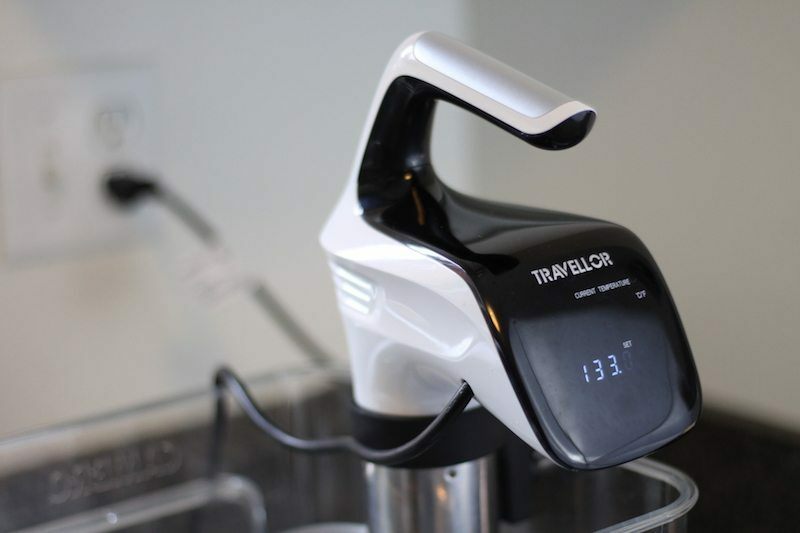 However, this is one of the most affordable sous vide set ups available, and would be excellent for new cooks that are looking to expand their repertoire of skills. This immersion circulator comes in a variety of colors ranging from shiny black to shimmery bronze, or a cool white. 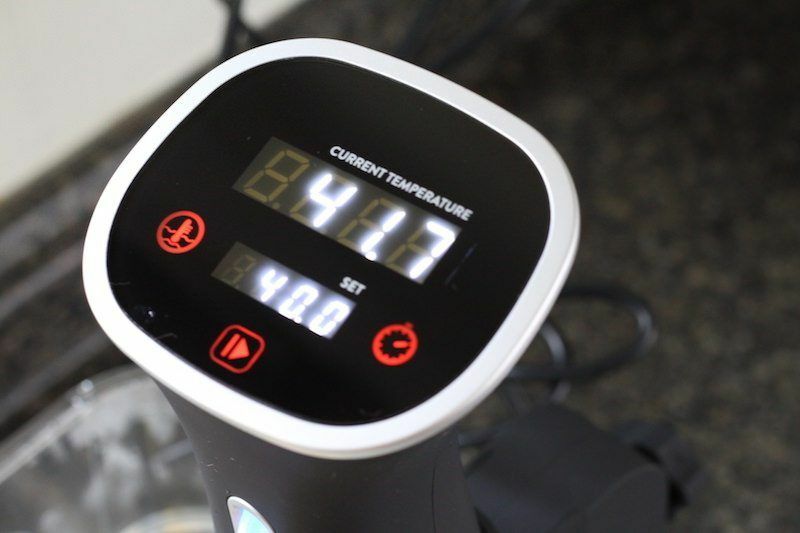 It is best utilized for many higher temp sous vide recipes, since it has a rating of 210°F maximum temperature, but not a minimum temperature listed. The GSV130 is one of the most reliable and most inexpensive immersion circulators on this list. The Nutrichef comes in 4 colors: Black, Gold, Silver, and White (black shown above). One of the main interest points of this brand and model is the price. 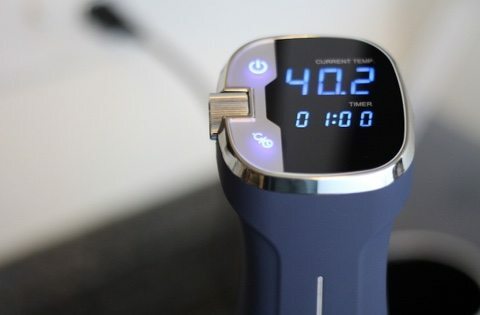 It's pretty hard to find an immersion circulator for just a hundred bucks, yet that's what the NutriChef version of this appliance is currently selling for. So far, there are a good number of positive reviews from customers that have bought it and posted pictures online. 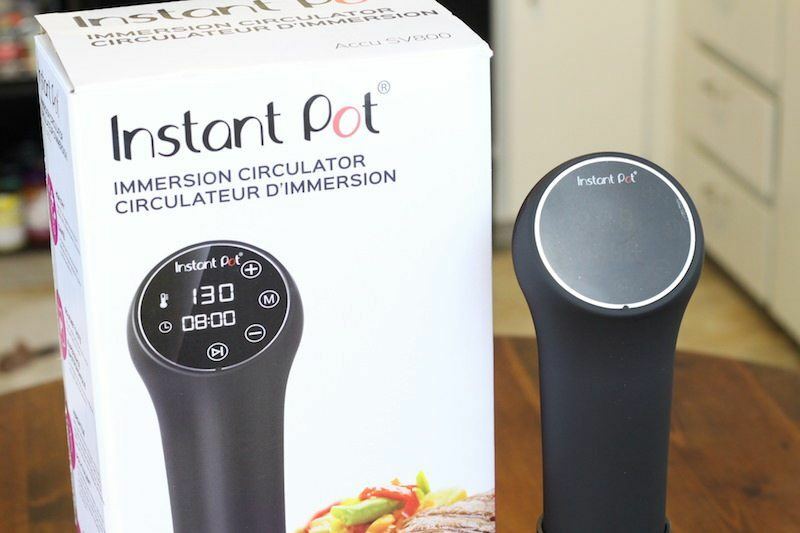 This particular immersion circulator will work with any deep pot. Plus, the LCD display makes it easy to control the settings track cooking time for your meals. You can set times of up to 60 hours. It's suspiciously similar to the GSV130 but currently about twenty bucks cheaper. Read the full review for more details and comparison with Gourmia models. Despite being my one of my favorite models of cheap immersion circulators, the GSV140 seems to be no longer in production. Here's my review of the GSV150, which is also quite affordable. Why did I like it so much? First off, you can choose from FIVE cool colors. There's black (shown above), gold (very cool), silver, blue, and white. It's also got a sleek design, that looks almost futuristic compared to some other, more expensive models. The LCD display can be used to set the desired cooking temperature as well as the target cooking time. After that information is set, you'll see your targets as well as current progress (current temperature and time elapsed at target temp). The temperature settings are accurate do +/- 0.01 which is pretty common for this type of appliance. 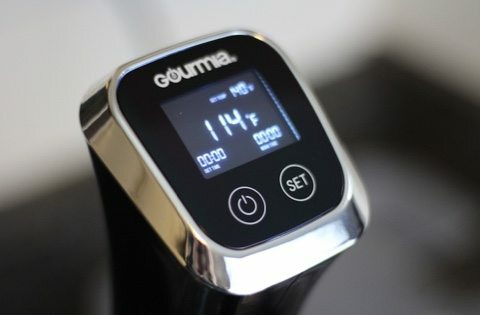 Again, the hundred-dollar price tag is very inexpensive, and previous models of Gourmia sous vide machines (GSV-130W featured above), including the full water bath) have performed well. There's also a sous vide cookbook included with your purchase! The Anova Sous Vide Precision Cooker is one of the more popular immersion circulators on Amazon right now with over 1000 reviews so far. Model PCB-120US-K1 is the new device, updated to include bluetooth so you can control your meal remotely through a smartphone app. They've since released the Gen 2 and Nano, so Gen 1 is kind of old news. This model can move up to 1.2 gallons per minute of water, so it will work with larger pots and meals, though the clip does adjust so you can use it with smaller ones. Using the digital display, you can set the desired temperature as well as cook time, plus you can set it for a specific start time. You can monitor the progress of your meal via the smartphone app, or even start it if you need to. Plus, you'll receive notifications and updates on the meal so you don't even need to be thinking about cooking while you're doing other activities. 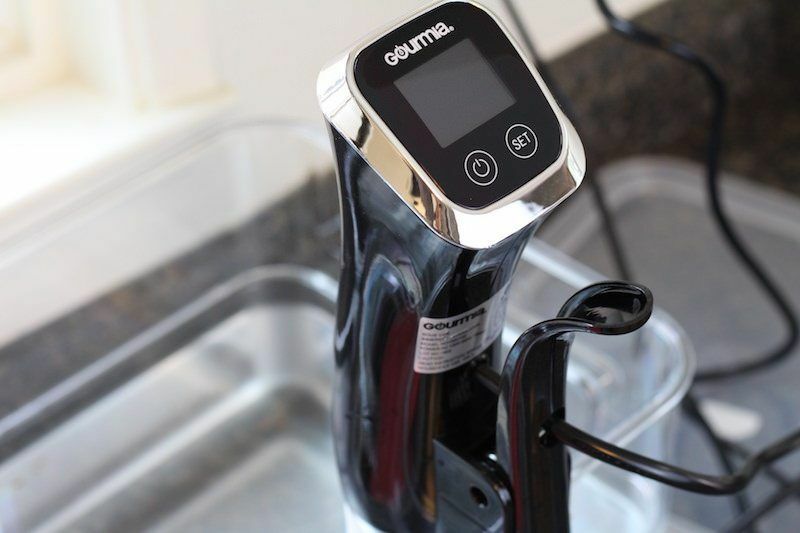 However, 800 watts is significantly less powerful than the 1200 watt capacity of the Gourmia models, which means your water will heat slower, and you'll need to wait longer to start your food. I suppose that issue can be avoided with bluetooth since you can operate the device via your phone, so it gives a bit more flexibility in how much time you spend in the kitchen. 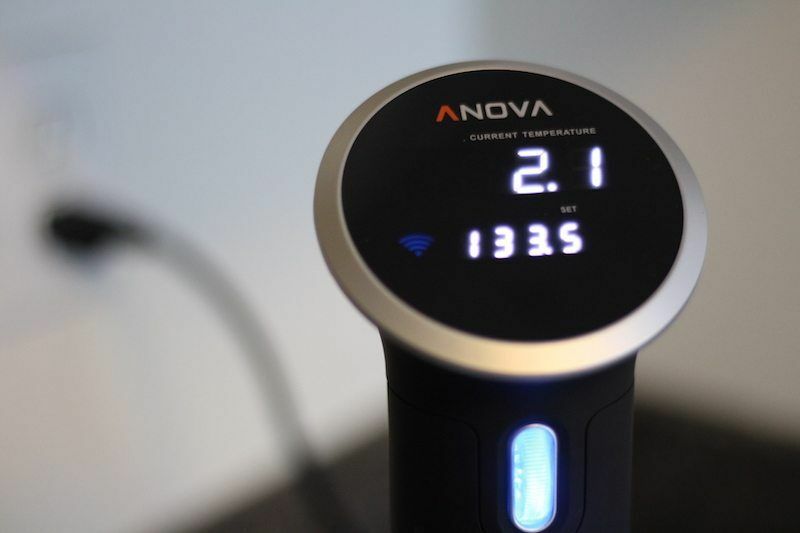 The second generation from Anova is more powerful in many ways, including that it has full wifi capabilities meaning you can access your device from anywhere as long as you have internet access. With bluetooth, you are limited to being in range of the device. It's also more expensive, so we've listed it on our premium circulator review page. Instant Pot are better known for their instant cookers, but it looks like they're venturing into sous vide territory with their new SV800 appliance. Priced just above the Gourmia and NutriChef models, it's still a very inexpensive appliance considering what it can do. 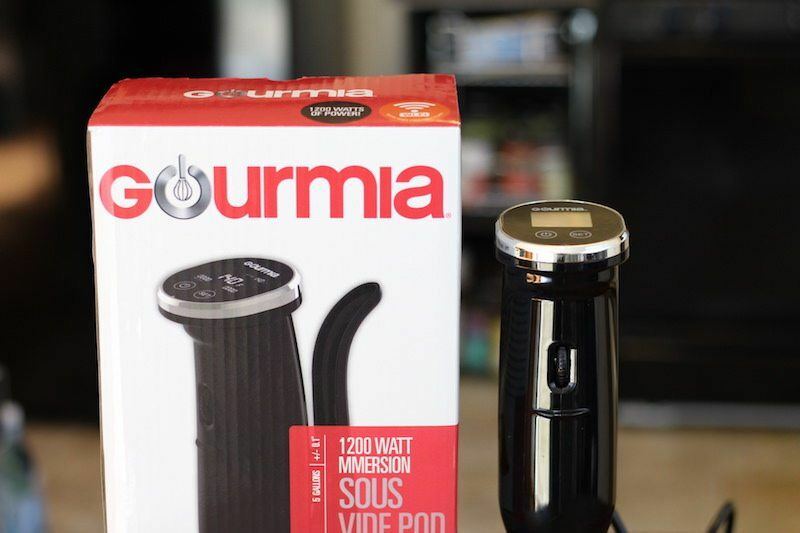 Not a lot of people have bought and reviewed this device, probably because it's quite new and the brand isn't as well known as others like Gourmia or Sansair. But overall, the reviews are positive. You can use this device with a 6qt to 8qt pot, and it will be able to maintain an accurate temperature for up to 72 hours. You certainly won't nee that long to cook, but it's great to know that you have the option to cook for truly extended periods of time. Two negatives worth mentioning are that it only has an 800 watt motor and only maintains a temperature accuracy of accuracy of 0.4°F/ 0.2°C. That may seem negligible, but all of the other models on this page are with .01.The Accu claims to have a very quite motor, so that may be due to the lower wattage. There is also no color choice, and the only one available is the one you see above, silver and black. 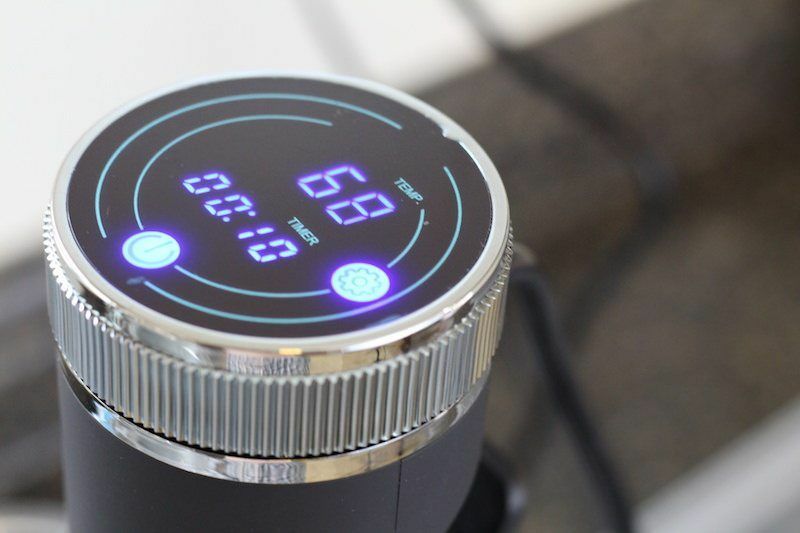 The Kitchen Gizmo Simplified Sous Vide is definitely the coolest looking of the bunch on this page. The advertising lives up to its promise of delivering an inexpensive appliance with a high-end feel. The textured blue material that surrounds the device really is one of a kind, and comes in 3 colors (blue/grey/red). This immersion circulator only has 800 watts of power which is pretty common, but still a bummer when you know you can get 1200 watts for a similar price. The hum of the motor on this one is also kind of annoying, which was a downside for me. However, it was not the loudest device I've tested! Awesome design and pretty good guts means that this baby made it to the #3 spot on my list of inexpensive immersion circulators. 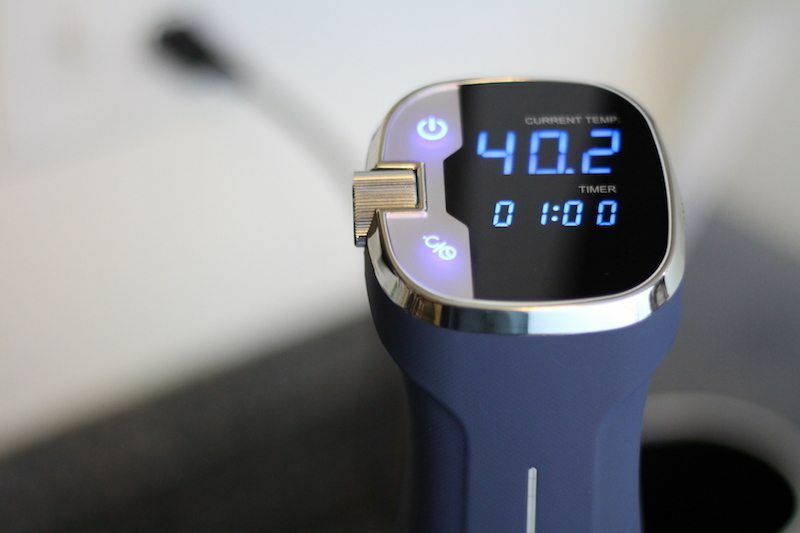 See the full review for more insight into what going on with Kitchen Gizmo sous vide. Plus, you can check out all three colors side by side, or you can head over to the Amazon page to see current pricing. Brand new from Gourmia, they are hopping on the “tech train” and now include bluetooth + wifi connectivity with their newest model. Being able to monitor and operate your immersion circulator remotely is not just cool, it can prove very useful! What's even more amazing is the price of the GSV150 compared to other wifi-enabled devices. It's currently selling at about 40% cheaper than other devices with similar capabilities. The trouble is, their app is not very good. There's lots of room for improvement in terms of programming your recipes and finding accurate information about how long to cook things. 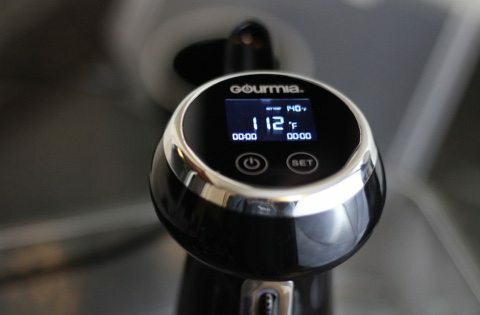 Wifi sous vide is cool, but you can probably do find with the Gen 2 model from Gourmia for now. Still, if the technology is too tempting and you don't want to do a full upgrade to the premium tier of immersion circulators, the GSV150 still cooks a mean steak! This is a very cool looking, unique immersion circulator from a relatively unknown brand. It's also inexpensive too, so that makes it not a bad choice to buy if you like the design. You can see more pictures in the full review linked below. I particularly like the spin-dial focused here in the picture. It doesn't do anything special except for set the time and temperature, but it's a little different from others on this list, so fun to play with. The starring feature of this device is how quiet it is. Much more so than Gourmia products, which I really like, but are quite noisy. However, it's only 800 watts of power, which means it'll take longer to heat, and only recommended to heat 3-5 gallons of water. That's pretty standard for this price range, so I'm not saying it's “bad”, but it's just not as good as some of the premium models. But since it's selling at a discount to even some of the basic models, it's something I would recommend. Brand: Kitchen Masters, Hampstead, + others? This one really isn't worth your time. 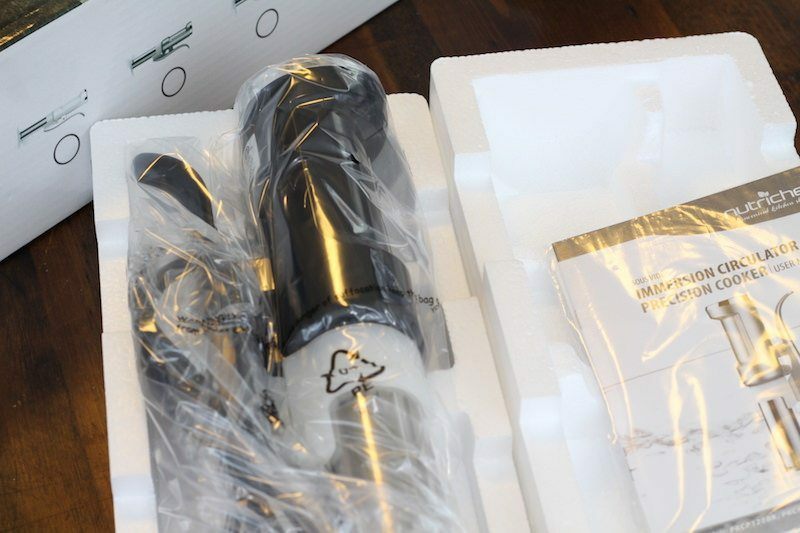 It's a cheap knockoff of the Anova Precision Cooker, and sold under different names, so customer support and warranties may be hard to come by. It seems to be sourced out of China somewhere, but it's hard to say. Sure, this one is cheap, but not any cheaper than some of the other reputable brands on this list. In fact, you can find cheaper products, with better heating, better design, and quieter operation. Yes, I completed the review, but I'm not going to link to the product page because you really should avoid this one. Another dud from a mystery company somewhere in China, this one-off product from the TravellorTech (or Travellor?) company is pretty weird looking. I guess if you like that look, buying this one would be an option. It did heat my food properly, and with the assistance of the Joule App, I was able to program the right temperature and time. But with so many other options out there that are smaller, better looking, and more powerful, I can't really think of a good reason to recommend this one. You can check out the full review for more details. One annoying flaw with this one is that the backlighting is quite dim, so hard to read sometimes. It's a minor detail, but that makes a difference when you're competing with so many other great products. I bought the Sous Smart SSV2700 at a steep discount, so was really hoping to recommend it as an ultra cheap way to do sous vide at home. Unfortunately, since then, the price has gone up. I think the discount was to attract buyers and reviews, but that's just a guess. The device performed alright for the couple of cooks I did with it. My pork chops turned out delicious. However, there are a number of issues with this device. The most unforgivable one is that the clamp which holds it to the side of the pot is very awkward to use. I really had to twist it to get it to clip to the side of my polycarbonate container. Getting it to clip to the side of of a stock pot was even worse. The ridges in the clamp are there for stability, I suppose, but they really make getting the device to stand upright more difficult than it needs to be. Major design flaw here! Also, the heating element portion is quite short. So for a simple cook where I don't want to use a lot of water (so the 850 watt heater doesn't take too long to reach target temperature), I still have to use a lot of water. I thought with a smaller shaft I could heat smaller amounts of water (hence having a smaller, more portable device), but that's not the case. It works essentially the same as the longer devices, so there's no advantage to it being smaller. That's a lot to say for a device I don't recommend. Since the price increase, I'd say you'd be much better off with something like the NutriChef Prime or GSV130 if you want to get the cheapest device available. These cheap immersion circulators are really close in price, ratings, and features. Since the writing of this original post, there's been a lot of changeups in what's available out there. Tons of Chinese and white label brands come and go, and I really can't recommend any of them. Gourmia models are reasonably priced and reliable workhorses. You will be fine with any one of their models. If you don't go for the Gourmia models on this page, then try Nutrichef or Kitchen Gizmo. It's another solid, reliable brand. Immersion circulators are a great way to introduce yourself to the sous video cooking method without investing a ton of money into something you're not completely convinced about. Even as an experience sous vide cook, you can get very precise cooking on a budget!